Sickle cell disease (SCD) is an inherited, lifelong blood disorder that causes individuals to produce abnormal hemoglobin, causing their red blood cells to become rigid and sickle-shaped. These sickled cells have a shortened lifespan, resulting in a constant shortage of red blood cells. When these sickled cells travel through the blood, they often get stuck in the smaller blood vessels, blocking other oxygen-rich red blood cells from freely flowing throughout the body. This leads to complications ranging in severity, including severe pain, acute chest syndrome (a condition that lowers the level of oxygen in the blood), stroke, organ damage, and even premature death. 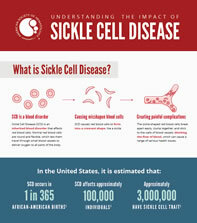 Globally, it is estimated that 300,000 infants are born annually with sickle cell disease. The majority of these births occur in low-resource countries, especially in sub-Saharan Africa where the World Health Organization estimates 70 percent of the world’s population of children with SCD live. The majority of children suffer from chronic pain and numerous infections; ultimately, many die before their fifth birthday. In the United States, nearly 100,000 individuals have SCD. The Centers for Disease Control and Prevention estimates that SCD affects 1 out of every 365 black or African-American births, and 1 out of every 16,300 Hispanic-American births. Symptoms of SCD can range from mild to severe enough to require frequent hospitalizations. Hydroxyurea, an FDA-approved drug for adults with SCD (often used off-label in children), improves the course of SCD and might lead to significant health care cost reductions. In a two year pediatric study, overall health care costs for children on hydroxyurea were $1.8 million, compared with $2.5 million for those who did not receive this treatment. Unfortunately, hydroxyurea is not regularly prescribed and adherence to the therapy is poor. In addition to hydroxyurea, blood transfusions can help to manage SCD, but they can lead to abnormally high levels of iron in the blood, which can cause long-term organ damage and reactions due to a mismatch between the donors and recipients. In addition to hydroxyurea, there has been early success in curing SCD through stem cell transplant, but this process is costly, dangerous, and is not widely available. Additional treatments and cures lie just over the horizon - emerging technologies like genome editing may hold the key to improving outcomes for individuals with SCD, but further research must be undertaken to speed the discovery and deployment of these options. Today, there are opportunities to transform this disease and the way we care for people with SCD. We are launching an international call to action on SCD by bringing together researchers, clinicians, individuals with sickle cell disease and their families, policymakers, and the private sector to focus our collective efforts and change the state of SCD around the world.